Ukrainian Orthodox Church of the USA - 66th Annual UOL Convention Concludes in Parma, OH! 66th Annual UOL Convention Concludes in Parma, OH! UOL delegates and guests gathered in Parma, OH at the Embassy Suites Hotel to review the accomplishments of the past year and to make plans for the upcoming year. In addition to the business sessions, the UOL Convention served as a time to rekindle friendships and to make new ones. On Wednesday July 24, both the Senior and Junior National Executive Boards held their pre-convention meetings. Registration was opened on Wednesday and coordinated by Pani Matka Mary Anne Nakonachny. Throughout the Convention the Registration room was wonderfully helpful with directions, suggestions, great conversation and always welcoming. President Martha Misko called the 66th Annual Convention to order. The presentation of colors and National Anthem was followed by a moment of silence in honor of UOL members of Blessed Memory. As part of the first business session committees met for the first time. The warmth and hospitality of the Parma Chapter was evident in the evening event chaired by Michael Nakonachny. The hospitality room was crowded with UOL members catching up with old friends. Thursday morning everyone gathered at St. Vladimir’s Cathedral for Divine Liturgy. His Grace Bishop Daniel celebrated Divine Liturgy. This year all Convention participants joined in communal singing of the Divine Liturgy under the direction of Markian Komichak. Following Diving Liturgy, all members joined for a full brunch. That afternoon the major work of the Convention sessions was completed. This included the approval of 65th Annual UOL Convention Minutes, review of the Annual Report-2012, Audit Report, and review and approval of Financial Report 2012-2013 that also included the acceptance of a 2013-2014 Budget. Convention Committees met to discuss important issues within our chapters and parishes as well as to make goals and objectives for the Executive Board and local chapters. Several committees were for Senior delegates including: Vocations and Clergy Support, Ways and Means, Nominating, and Resolutions. 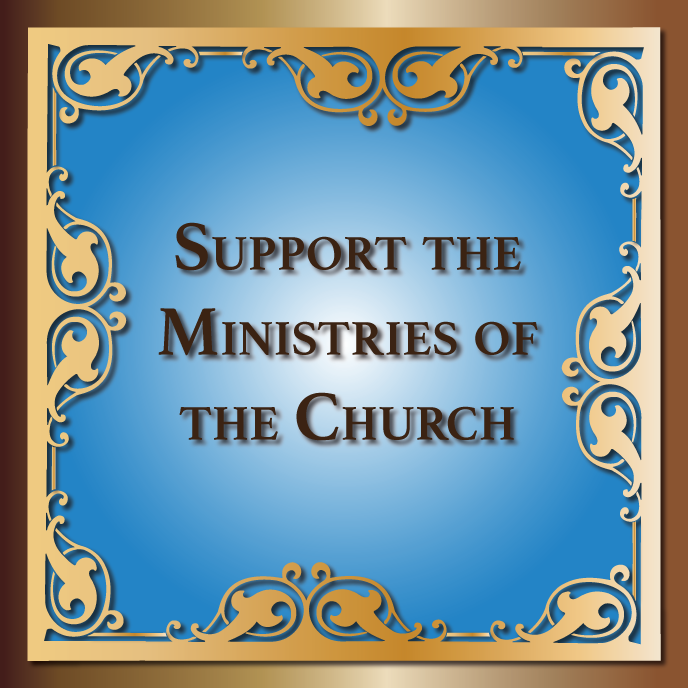 There were also several committees that were combined Junior-Senior Committees: Christian Caregiving and Missions, Youth, Membership & Chapter Development and Education. After the individual committees met and discussed appropriate topics, each submitted a report to the convention body for final ratification. Thursday evening the UOL family gathered at the Cleveland aquarium. All members enjoyed the beautiful displays and gathered on the top floor of the aquarium for a delicious meal and dancing. On Friday the business sessions continued with reports for each of the committees being approved. A highlight of the Convention was the filming of the first ever UOL video. Adam Kennedy from St. Vladimir, Philadelphia, PA, interviewed UOL members as well as taped aspects of the UOL Convention to create a video that can be used for membership and chapter development. Sessions started winding down with the election of officers, those individuals challenged to fulfill the goals set at this UOL Convention. His Eminence Metropolitan Antony appointed His Grace Bishop Daniel as Spiritual Father and Fr. John Harvey of Youngstown, OH as Spiritual Advisor. Additionally, Martha Misko will serve as Immediate Past President and Convention Coordinator. Moreover, His Eminence Metropolitan Antony appointed Rev. Vasyl Sendeha as Spiritual Advisor to the Junior Board. Following success UOL deliberations the Convention body enjoyed a festive evening at St. Vladimir’s Parish Hall. The hall was transformed into a night scene from Kyiv. A delicious dinner of borscht, varenyky and fish was enjoyed by all. The Kashtan Dance Ensemble wowed the crowd with a spectacular performance. Following the performance UOL members danced to the delightful and energetic music played by Harmonia. Everyone moved on to the New Jersey Hospitality room to celebrate plans for next years UOL Convention to be held in South Bound Brook New Jersey. The hospitality room was packed to capacity and full of wonderful friendships. Saturday morning started with morning prayers and featured two hour-long workshops. The first led by his Eminence Metropolitan Antony was a slide show of pictures from the Pilgrimage to the Holy Land. Over 35 people attended the workshop which was spiritually uplifting. The second workshop was led by Laryssa Charest and focused on Ukrainian Dance. Saturday evening featured Martha Misko as the mistress of ceremonies and she guided the evening very gracefully. Awards were presented including Chapter of the Year to Philadelphia, PA, as well as presentation of Scholarship and Junior Awards. Additionally, the UOL presented Metropolitan John Scholarship Fund to St. Sophia’s Seminary on behalf seminarians. Once the banquet was complete the band entertained and dancing continued through the night. Sunday morning the National Senior and Junior UOL Presidents as well as parish representatives greeted His Eminence Metropolitan Antony with flowers and the traditional bread and salt. 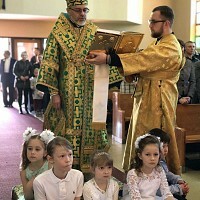 At the conclusion of the Hierarchal Divine Liturgy the officers of the National Executive Senior and Junior Boards took their oath of office. Following Divine Liturgy, everyone was invited to participate in a lovely lunch at the parish hall. The Parish Chapter and Parish are to be commended for a fantastic Convention. Special thanks to Convention Chairperson Melanie Nakonachny and Spiritual Advisor Fr. John Nakonachny for all of their hard work. Their labor of love, in planning this convention truly serves as an inspiration. 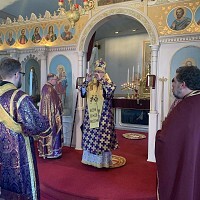 20th Regular Sobor of the Ukrainian Orthodox Church of the USA!